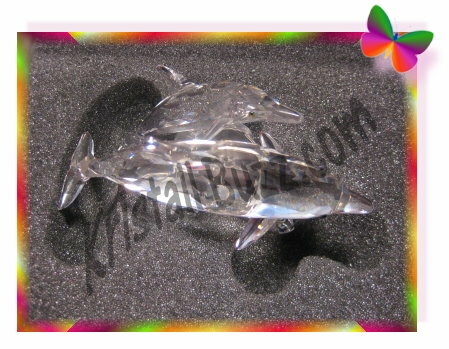 The first Swarovski SCS crystal figurine in the “Mother and Child” series was the Swarovski ‘Lead Me’ Dolphins. The Dolphins were a beautiful figurine depicting the nurturing relationship between a mom and her calf. 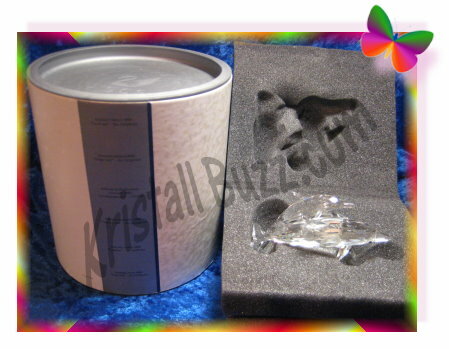 The protective box is important to safely store the crystal figurine. The Swarovski Dolphins Box is a big white cylinder with silver-gray end caps. On the Dolphins cylinder, collectors can read the text ‘Annual Edition 1990 “Lead Me” – the Dolphins. This same text is repeated in 5 other languages in the silver stripe on the container. The Swarovski –assigned reference number can be found near the bottom edge in a very small type. The Swarovski Dolphins Box reference number is DO3MM90XX. The Dolphins Box can also be found using another reference # DO1X901B, which was originally used in the Warner’s Blue Ribbon Books on Swarovski catalogue. The foam was specially formed to securely store or ship the SCS Dolphins figurine and certificate. The dolphins foam contains a slot to be used for keeping the certificate unbent or wrinkled. The SCS Dolphins have been the most difficult figurine to correctly place into the foam. Good news though….this article contains proper placement instructions for correctly putting the crystal figurine into the Swarovski ‘Lead Me’ Dolphins Box. The dolphins foam should opened and placed such that the certificate will be underneath the crystal. In your hands, hold the Swarovski Dolphins, so that the dolphin’s nose is facing right (3:00) and the base is toward the foam. Press the Dolphins downward into the foam so that the tails are in the largest oval slot. Note: If the SCS Dolphins have been on display (not stored in the foam and box), the fit may feel firm and incorrect, but this is normal. Since putting the Dolphins in the foam may feel erroneous, many collectors have taken scissors or knives to the foam cutting it and eliminating placement confusion. This could potentially devalue the SCS Dolphins which is complete with box and certificate to a Swarovski fanatic who demands a ‘top-notch’ package since technically the foam has now been altered. A special thanks to Swarovski expert Jane Warner, co-author to Warner’s Blue Ribbon Books on Swarovski for consulting on the ‘Lead Me’ Dolphins Box article. Regarding availability and replacement value, the SCS Dolphins Box is not readily available. The last one that sold was over 5 years ago, and those prices are too out of date to even mention.